Prevention is better than cure, especially when it comes to dealing with the high rate of crime. No one would want to end up becoming a victim of violence or theft of any kind. Being prepared to deal with unwanted and unsettling situations is one of the best ways of keeping yourself and your family safe and secure. Anyone who owns a home or a business would understand this perfectly well. As per a survey conducted by Gallup in October 2013, it has been found that although the crime rate has been rising, few Americans are aware of this worrisome fact. The bottom line is that crime, especially the kind which involves violence, is growing, and with an increase in crime rate sometimes situations call for citizens to protect themselves. Thankfully there are ways to keep criminals at bay and deter them from committing offenses. Even the smallest crime can cause great losses. It is, therefore, better to be prepared or at least equipped enough to identify, nab, and bring the culprit(s) to book. Security cameras are among the most effective ways of preventing your home or business from getting burgled. There are a variety of cameras widely available in the market today, and you can easily choose from among them based on your requirements. 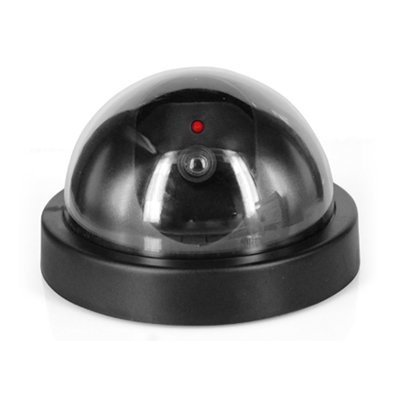 A lot of people install dummy or fake security cameras with the hope that the sight of it would be enough to frighten and eventually ward off troublemakers. Let’s learn a little bit more about these cameras. 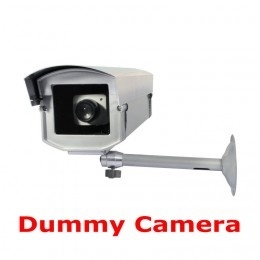 What Is a Dummy Camera? Dummy cameras are those that look as real as the actual thing but are fake. They come in a variety of shapes and sizes. People can choose depending on what works best for them. While most cameras have basic features, the more advanced ones also come with zoom, pan, and tilt features. So do take this into consideration. They also have a blinking red light right in the front, which is a prominent feature of these cameras. The red light is supposed to give people an impression of there being a functional security system in place. However, because most real security cameras come without this light, security experts recommend not buying cameras with this feature. Apart from the blinking light, dummy cameras serve no real purpose. Experienced criminals can tell from the red light that the security systems will not be potent enough to stop them, and are least intimidated by them, which allows crime to perpetrate. Secondly, when a camera moves in all directions at random instead of tracking one person in a particular direction, it can make criminals easily decipher that it is a dummy. Fake cameras do, however, have a plastic lens, 1 – 2 cables, a metal body, and a seal of legitimacy. They can easily be procured from retailers. Apart from that, you can also buy them online. They’re cheaper than real cameras, which makes them an affordable option. It can be extremely easy for knowledgeable criminals to identify a dummy camera when they see one, which means that it would be a pointless addition to your security measures. Thanks to the blinking light, the single-wire connection, and the arbitrary movement of the lens, it might give itself away more easily than you would think. It is better to go for a real camera, as that way you have something substantial to bank upon. Sure, it’ll cost you more, but it will also give you the desired output. 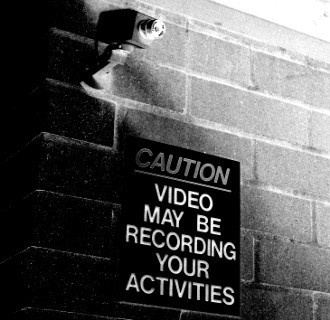 A dummy security camera can only help deter criminal activity at best. Should the crook identify the camera to be a fake and commit the crime, it will not provide any proof of the occurrence of such an activity. There will be no faces to identify, no solid evidence that can help you or the police know more about the crime. Additionally, if potential criminals get a whiff of the fact that the security systems in your vicinity are fake (from neighbors, past-employees, etc. ), they may not hesitate in executing the crime at all, which leaves you highly vulnerable with zero protection. While a security threat from criminals is obvious, imagine what would happen if one of your own breaches your trust and takes undue advantage of fake security systems? When security agencies install dummy cameras in a particular neighborhood, they typically inform the residents that they are a fake so that the residents do not completely rely on them. However, as mentioned earlier, your neighbor(s) can accidentally let this information slip to a smooth-talking outsider with vested interests, which can open up scope for crime in your area. Or worse, unpleasant neighbors could use this knowledge and commit crimes for settling their personal scores. As if the above issues weren’t enough, using fake cameras has legal implications as well. Over the past few years, several home and business owners have been sued for using fake security cameras. Owing to the false sense of security that these cameras provide, ‘victims’ argue that they were misled into believing that their vicinity is under constant surveillance and hence, is safe. In many such cases, the defendants would not have been held accountable had they not installed any camera at all. For example, say an employee knowingly parks his car, or leaves his valuables within the company premises in the full view of the security camera, assuming that it would be safe there, but returns to find that they have been stolen. It is obvious that he would ask to take a look at the video footage. But there is no way to videotape or record anything on a fake camera, so the employer would have no video for him. Not only can this leave the employer red-faced, but also battling a lawsuit. Some may argue that having a fake security camera in place is better than having no security measures at all, especially in areas where the rate of crime is high. They’re not wrong in their thought process, but they need to realize the implications of installing a fake camera instead of a real one. Installing a dummy camera just because it is cheaper than the real one is definitely not the answer to your security concerns. It is always better to stretch your budget a tad and invest in the real thing to be and feel completely safe and protected.